For his latest documentary film 'Cave of Forgotten Dreams' Werner Herzog takes us on an incredible 3-D journey into the Chauvet caves in Southern France: enormous chambers full of the oldest prehistoric art known to man. Modern 3-D brings these ancient works of art to life like nothing else: glide through the cathedral-like cave, over cave formations and sloping passageways, across the beautiful 32,000 year old drawings. These scenes are interspersed by interviews with scientists musing on the cave's mysterious beauty, the evolution of creativity and the nature of humanity. Operatic, gorgeously accomplished and truly unforgettable: this is an extraordinary glimpse at, perhaps, the dawn of art itself. Having always been a huge fan of the filmmaker Werner Herzog, having always been skeptical of and inevitably disappointed by 3-D movies, and having had the good fortune of going into Chauvet Cave myself, I had serious reservations about 'Cave of Forgotten Dreams'. The very first scene, however [of the rows of vineyards with their highly sculptural and graphically gnarled vines, standing in welcome in 'Pan's Labyrinth' style, leading up to the abrupt white cliff where Chauvet resides] immediately confirmed my hopes and dismissed my fears. And from the start, the characteristic crisp and clinical German accent establishes the gravitas that these 35,000 year old paintings deserve. The film is perfectly punctuated by short and seemingly spontaneous interviews with the scientists, who despite their studied analysis and cautious interpretation, appear unable to resist an - albeit measured - emotional response to these works of art. And what of the filming? Only Herzog's 3-D filming can capture the true essence of the cave; its topography, its perspective, its claustrophobia, its wonder. 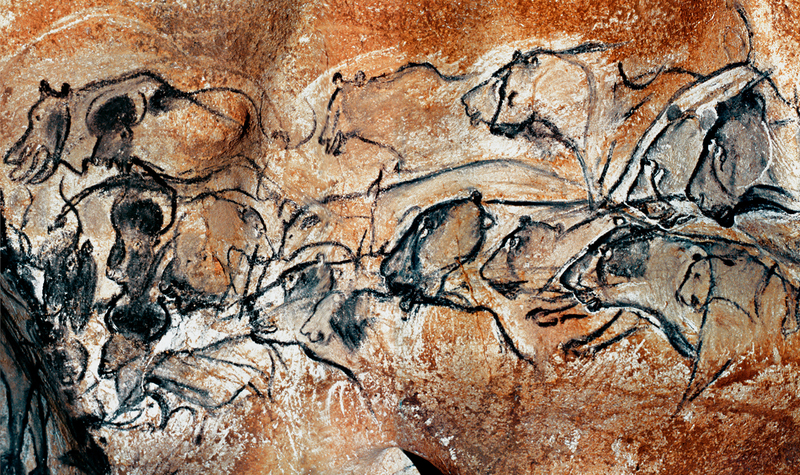 As chambers lead to chambers, from darkness to light then back to darkness, the viewer is invited to empathise with an Ice Age ancestor passing through Chauvet Cave. Moreover, the 3-D effect shows how the stone canvases were chosen and employed by the artists. Unlike the technically 'flat' masterpieces of art that we associate with galleries and museums of, say, the last four centuries, these paintings use the contours, dips, hollows and fissures to enhance the paintings. This allows the viewer to consider the concept of the stone not as a wall but as a veil; a veil to the spirit world which encompassed the 'fluidity' and the 'permeability' - the way that contact between worlds, or domains of reality, takes place - which Jean Clottes explains so calmly yet emphatically. If you want to get to grips with the hypothesis that a Palaeolithic cave painting acted as a possible opening into the supernatural world, then 3-D filming is a very persuasive tool. But the 'mystery' of Chauvet is never squashed; the silence that now surrounds the Bear Skull Altar reminds us that we can look, and we can learn, but we can never presume to fully understand.